Banksy’s Shredded Art Work: How Could This Happen? 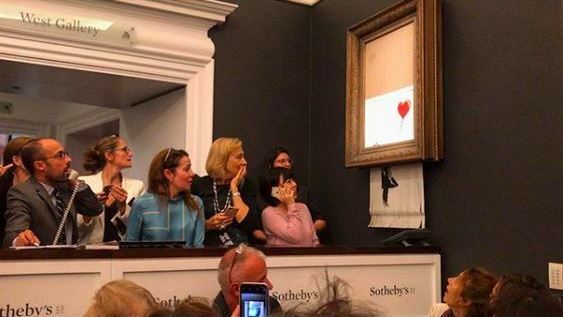 Last month, the art world was both amused and shocked when Banksy destroyed his famous art work “Girl with Balloon” right after it had been sold for almost $1.4 million at Sotheby’s Contemporary Art Evening Auction in London. How could this happen? According to Banksy, he built a hidden mechanism into the Victorian-style frame in 2006 to ensure that the art work would be destroyed if ever put up for auction. The anonymous artist also said that the print was supposed to have been completely destroyed by the shredder, but something went wrong and part of the canvas remained intact. As a result, we can now enjoy a very important piece of art history, which was created right during a live auction. Moreover, the art work in its shredded state, which was renamed to “Love Is in the Bin,” is now worth a lot more. The experts say that Banksy’s prank added at a minimum 50 percent to the print’s value. So, what do we have for today? A print that was supposed to be fully destroyed is now one of the most valuable works by Banksy, which is likely to be displayed in museums worldwide. Along with that, not all people believe that this art work was really shredded and that Sotheby’s had no idea that it would happen during the auction. Besides, how could a battery and a shredder installed in the frame many years ago last until 2018? There are many questions that we cannot answer right now, but, hopefully, we will know the truth about the world’s first shredded art work in the future. Anyway, Banksy himself is clear enough in this matter, “Some people think it didn’t really shred. It did. Some people think the auction house were in on it, they weren’t.” It is up to you whether to believe the artist’s words or not!